To record a valid vote, write the numbers 1, 2, 3, 4, 5 and so on, in the squares in the order of your choice, anywhere on the ballot paper. Don’t use the same number twice. Remember, use numbers only! One of the most common mistakes is for people to use ticks and crosses on their ballot papers. This means that their vote cannot be counted. You should fill in at least as many squares as there are vacancies. This means at least 5 preferences should be written on your ballot paper. If you don’t fill in this many squares (even if you vote for only one candidate) your vote will still be counted. However, to make the most of your vote, we suggest you continue to fill in the squares until all your preferences are recorded. You may fill in every square if you wish. If you don’t vote for any candidates, your vote will be informal. If you make a mistake on your ballot paper, just return it to a polling official and ask for another. 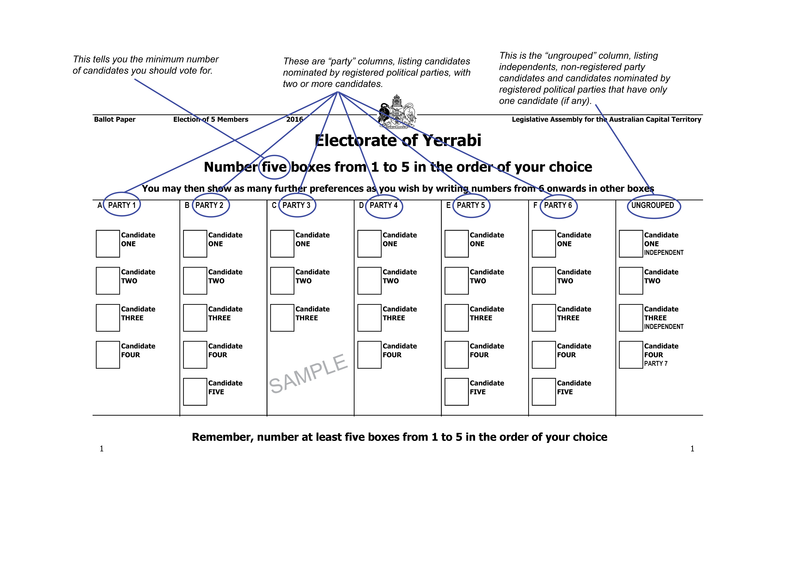 A feature of the ACT electoral system is the Robson rotation method of rotating the positions of candidates within each column on the ballot paper. Candidates’ names are printed in different positions within a column on each ballot paper. The order of the names on your ballot paper may be different from the order on the ballot paper given to the voter next to you. This means that no candidate has the advantage of appearing in the top position on every ballot paper. By combining Robson rotation with the ban on canvassing within 100 metres of a polling place, the ACT electoral system places in your hands the opportunity to consider each candidate and vote for candidates by name in the order of your choice.